A Master Plan is a global proposal of uses and spaces on a certain area to plan its development in a coherent and integral way. The proposal is given a singular nature and a marked character indicating the belonging of each of its parts. The Master Plan designs, distributes, communicates and above all relates complementary uses to each other (residential, commercial, tertiary, community services, leisure, communications, open spaces, etc.) within a unique and singular concept. The objective of this project is to propose the global zoning of a plot in the northern zone of Jamaica, as well as a preliminary analysis of the services necessary for its development. The aim of this initial planning is to distribute, communicate and interrelate the different uses that are proposed in the plot: hotel, residential and tertiary, achieving an optimal development of the whole, both in itself and in relation to its environment in all its aspects. Residential122 plots have been considered for single-family homes that may be isolated or paired buildings of about 250m² distributed over two floors. In the central area, where the topography is gentler and there are good views of the sea, the common area has been placed, consisting of several sports courts, swimming pools and a building that would house a cafeteria and changing rooms. HotelThree hotels are proposed, all with elongated plots in a north-south direction, with a similar seafront and with a very similar usable area, seeking to provide the three with an equivalent market value. The hotels will have 700 rooms resort type rooms, with an approximate average area of ​​55m² per unit. Most rooms will enjoy views of the sea. The buildings with rooms will have five floors, and the common area buildings will have two. Tertiary (both commercial and active leisure)Due to its dimensions, this is the foreseen location for services that could be communal to the future developments of the action as a whole. It will be necessary to carefully study each of the needs to propose the best implementation, with the utmost respect for environmental aspects. Study of regulations and urban planning. Master Plan for urban planning. Distribution of roads and plots. 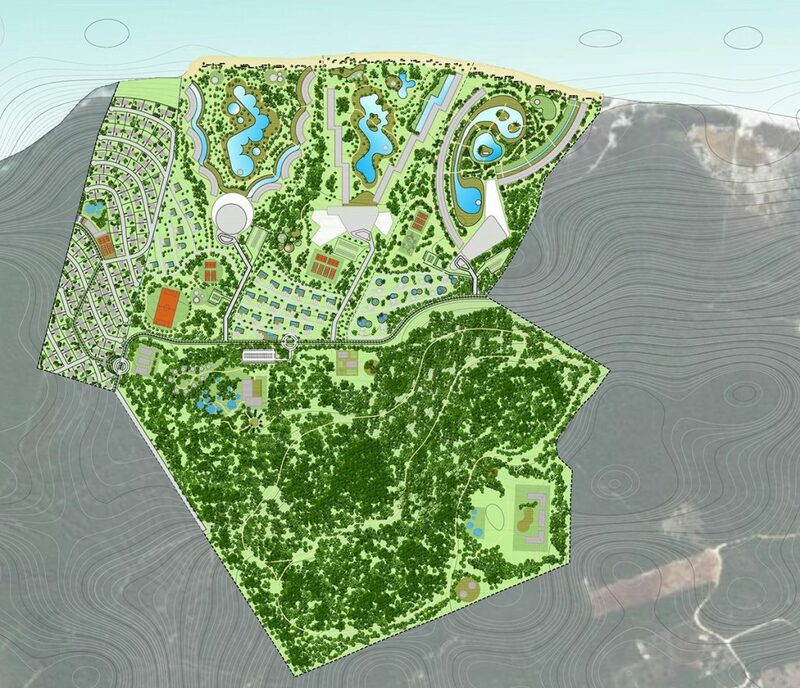 Master Plan in Coral Springs, Jamaica. On the north coast of the island of Jamaica, near the town of Coral Springs. East of Falmouth, capital of the parish of Trelawny to which it belongs, which is in the county of Cornwall.